Honored at the 4th edition of the Annual India Leadership Conclave and Indian Affairs Business Leadership Awards 2013 Event at Mumbai. One of the fast growing Multi-super specialty tertiary care chains of India, Global Hospitals Group, has received yet again the most coveted and prestigious awards in Healthcare. At the 4th Annual India Leadership Conclave and Indian Affairs Business Leadership Awards 2013 Event at Mumbai that was attended by the healthcare industry luminaries, Global Hospitals Group was awarded the “India’s Most Valuable Health Care Chain Award’ for 2013. The Award are extremely significant because the Award Jury Committee adapted the Public Nomination Voting system. The Jury Members under the clause of Nominations looked at all the finer details before arriving at a conclusion. The decision came after a close scrutiny of all the nominees under voting, recognizing the tough task building a differentiated and niche multi-super speciality tertiary care hospital chain and evolving into a reckon to with, Brand & sustaining the momentum in a fiercely competitive Market. India Leadership Conclave & Indian Affairs Business Leadership Awards organized by Network7 Media Group’s Indian Affairs Magazine, Asia’s biggest analytical news Magazine, is one of India’s prestigious & coveted title & has established a credible platform of serious discussion where Brand India’s most illustrious Leaders & icons assemble to discuss the roadmap for India’s growth trajectory. 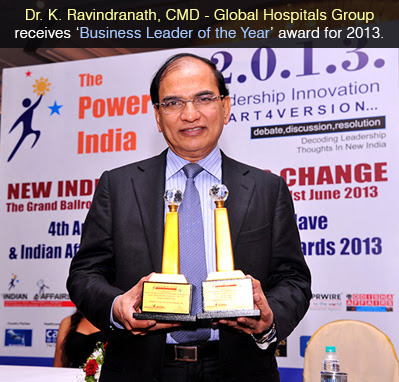 Dr. K Ravindranath, received the prestigious “Business Leader of the Year” for his outstanding contribution to the field of medicine and for his visionary leadership. The Award are extremely significant because the Award Jury Committee adapted the Public Nomination Voting system. June 5, 2013, Chennai: 11 year old Niloy Haque from Bangladesh had a medical case history that was long and eventful. When parents along with Niloy Haque arrived in Global Health City they were deeply worried about the mysterious neurological illness that their son was experiencing, severe enough to alter his family’s entire lives. After stress leading to a rare ‘Conversion Disorder’ in an exceptionally intelligent 11yr old boy parents were not very enthusiastic since the treatment were not yielding desired results in various hospitals across the globe. Six months later, after due deliberation the parents decided to shift their son to Global Health City for further medical management. Dr V Murugan, Paediatric Neurologist and Dr Vijayasaravanan Palanivel, Paediatric Neurodisability Specialist at Global Health City who first reviewed the boy said, “He appeared much tensed and anxious, didn’t want any eye contact and spoke in a feeble voice. He was in his wheelchair and while we were speaking to his parents, he suddenly started twitching his whole body.” He was admitted and closely observed for 3 days. A thorough clinical examination revealed inconsistent physical signs. Investigations performed at Singapore were all reviewed and they were normal. A psychology assessment showed that he had “very superior intelligence” and stress factors in the family. He lived in a large joint family and there were conflicts with his siblings, being teased by his cousins, overprotective mother and authoritative father. A car in which he was traveling to school met with an accident and it was badly damaged. That left him withdrawn for a few days after which the neurological symptoms developed. The doctors at Global Health City after due consideration determined that the mysterious illness was not epilepsy or immunologically caused, but as “conversion disorder”. Dr Murugan, Consultant Paediatric Neurologist, Global Health City emphasised that it is critical to understand that victims of conversion disorder do not fake symptoms. Their physical symptoms are true and their suffering is genuine. All his medications were gradually tapered and stopped and his care was taken over by the Neurodisability Multidisciplinary Team (NMDT) headed by Dr Vijayasaravanan, consisting of physiotherapists, occupational therapists, psychologists, creative art therapists and yoga therapists. After two months of physical therapy, behavioral therapy, relaxation through dance and yoga, parental counseling and coping skills training, there was a dramatic improvement in his physical and mental abilities. He was able to walk and run. He appeared a lot happier and interactive. Parents were pleased that their son was “back to normal” and became independent in all his activities of daily living after 11 months on wheel chair. “Everything seemed fine with him until a year ago”, said an emotional father. “Suddenly one day, he started having involuntary twitching body movements and started speaking to self. Things started to deteriorate, fast; he was unable to walk and complained of loss of sensation in his legs and arms”. “I would like to thank the medical team at Global Health City for adding ‘more to life’ and putting my son back on his feet” he further added. Conversion disorder is a bizarre and rare condition which can strike down otherwise healthy young people, leaving them unable to walk or talk. It is a mystery and can baffle the doctors as physically the patients have nothing wrong with them. As a result the diagnosis is often missed. Thorough history taking, including a psychosocial history and examination is the key to diagnosis. Stress is the main underlying cause of conversion disorder. The stress could be either physical or psychological, and the level at which the disorder occurs varies in every person.